Sandy Wilson’s affectionate spoof of flapper-era musical comedy began life at The Players Club in April 1953. It was expanded into a three act production and then opened in London at Wynham’s Theatre in 1954 and this happy, amiable and funny musical has remained a popular choice for societies. It has a wonderfully varied score and offers perhaps the best pastiche in the history of musical comedy. The stylised characters and dialogue are charming. I directed it myself about four years ago and that sometimes puts a different slant on expectations, however I thoroughly enjoyed TJ’s interpretation of ‘The Boy Friend’ The choreography was super and how lucky you are to have young men who can dance! The talented cast worked hard under his direction and the end result was an extremely polished entertainment. The cut out props were a great touch and added to the almost ‘pantomime’ feel, albeit a sophisticated one. Diane McGuire and her musicians played the overture and accompanied the musical numbers expertly. The music was never too loud. The business on stage during the overture made for visual as well as aural entertainment for the audience, and the simple setting of a chaise longue and a table for the telephone was all that was needed. The boldly patterned ‘wallpaper’ was a little loud, possibly the colour was too bright for the period, but once the cast were on the stage in their quite splendid costumes then it was less obvious. Connie Law made a saucy French maid and her accent was good. I saw her play the same role in 2004 when you last staged the musical — she appeared completely at ease in the role. The four friends, Maisie, Dulcie, Fay and Nancy were all played strongly by Lucy Smith, Annelly James, Gabriele Law and Harriet Law. They were all delightfully upper class in accent and behaviour and each clearly portrayed their individual characters. Polly Browne is not the most winning of the ladies roles, the others are so much more stereotypical of the era, but Tara Cimino pitched it just right and we were drawn into her dilemma of not having a boyfriend and her need to be like the other girls. Her singing was good. As the Madame responsible for their ‘finishing’, Aileen was absolutely superb. Her facial expressions, acting and singing were a joy and she commanded the stage each time she appeared. The offstage chemistry made the onstage chemistry natural and in the role of Percival Brown, Nigel was good. There isn’t as much fun to be had with his character but when they were together there were some very amusing moments indeed! ‘Fancy Forgetting’ was notable. Marcel, Pierre and Alphonse, were played respectively by Chris Taylor, Harry Rodgman and Tom Manley who gave sound performances and were credible as young French beaus. Charlie Booker came across well as the young American Bobby Van Husen. His accent was convincing and he and Maisie can do a first class Charleston. This particular role showed his ability as a performer, being in complete contrast to the role of Jack in ‘Into the Woods’. Masquerading as the delivery boy for Gaston’s, Jack Griffin also showed his versatility. He made a lively Tony, acted and sang well and his tap dancing was very good. This was Maggie Dean’s second outing as Lady Brockhurst and she played her convincingly. She was haughty, upper-class, with good carriage and accent— and quite scary. Playing her hen-picked husband with a roving eye Mike was good. His height always adds something to the comic roles, not so much with Maggie in this show but certainly with pint sized Dulcie in ‘It’s Never Too Late’. That’s a really good number and they handled it well. ‘Sur la Plage’ was visually and musically an entertaining opening for the second act. 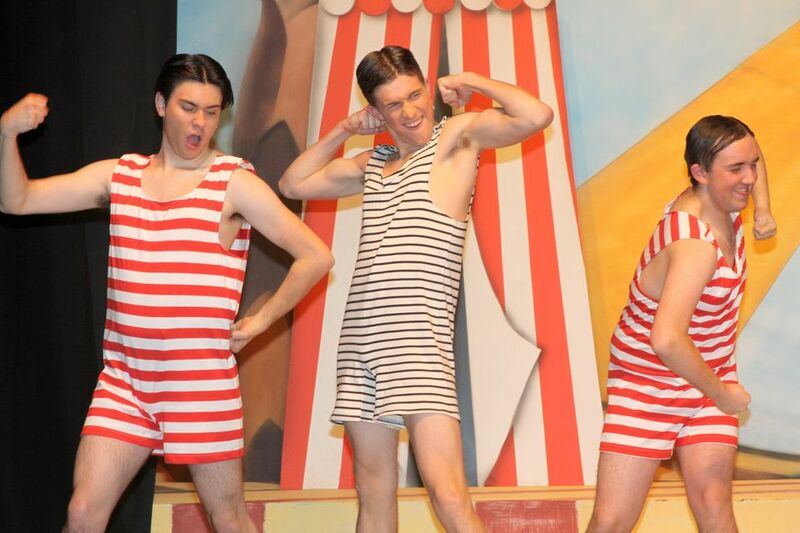 The third act fancy dress costumes portrayed a wonderful mixture of characters and ‘The Riviera’ was fabulous. In that number the vocal dynamics, the dancing and the lighting were excellent. The Carnival Tango was dramatically presented, and earlier the Promenade Act was an interesting way to fill in the time during the scene change. It was well sung by the trio. I always appreciate a different ‘walk down’ – there were three in fact – but the audience didn’t realise the first one was happening as it wasn’t very positive. The company songs were first rate both on movement and singing and as always they added enormously to the presentation of the production. Lighting was really good but the sound was over amplified. I’m afraid I had to put my fingers in my ears for some of the numbers, something I’ve not had to do before. We are all used to loud West End productions (I do the same there too!) but in a small venue it was a bit too much. The amplification possibly didn’t bother other people but I felt the need to mention it as it did bother me. Wigs looked good and make up was good, but Dulcie looked extremely pale compared to the other girls. Your programme is nicely presented and interesting to read as your programmes usually are, and the front cover is striking. The production was of a very high standard and it would be difficult to find any fault with it. Congratulations to you all– it was an utterly delightful entertainment. Thank you for inviting me to see ‘The Boy Friend’ and also for your hospitality on the evening.